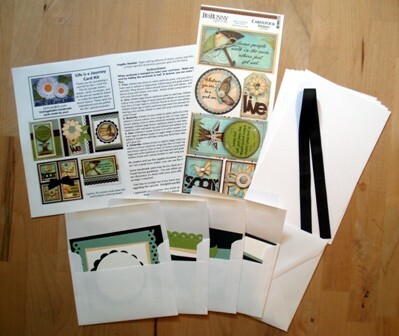 When you purchase one of our card kits, you will receive just about everything you need to make the cards pictured. All of the card stock is pre-cut and all of the pieces for each unique card are sorted and packaged individually in provided envelopes. On occasion, the cards in a kit such as a large "thank you" or "Christmas" kit will share the same layout. To keep the cost of the kit low, all of the pre-cut papers will be packaged together in one envelope or sealed cellophane bag. Your kit also contains all of the embellishments and the blank cards. We always provide complete instructions with a professionally printed full-color photo. Most of the cards we sell are A2: 4 1/4" x 5 1/2" with coordinating envelopes. On occasion, we will make cards that are A1: 3 1/2" x 5", 4" x 8", 5 1/2"x5 1/2", 3"x3" or other sizes. The cards always come with envelopes in corresponding sizes. The insides of the cards are blank unless otherwise indicated. Paper crafting adhesive, pop dots or foam tape, scissors, and a glue dot or two are usually all you need to assemble the cards. On occasion, common paper crafting tools are needed but often household items will suffice such as substituting a hammer and nail for a brad punch. You can find a few of our favorite and recommended supplies for sale under the "Supplies" category on the left. All products that are used are of the highest quality. American Crafts and Bazzill textured cardstock are our cardstocks of choice. The stickers, stamps, rub-ons and other embellishments are all from top brands in the industry and include Canvas Corp.,Simple Stories, May Arts, Mark Richards, Pebbles, Inc., Bo Bunny, Doodlebug, Imaginisce, My Mind's Eye, October Afternoon, Prima, Pink Paislee, Fancy Pants, Theresa Collins, EK Success, American Crafts, Echo Park Paper, We R Memory Keepers, Kaisercraft, Basic Grey, Cosmo Cricket, Bazzill and more. Many kits contain die-cuts and punched pieces from Cricut, Sizzix, Cuttlebug, EK Success, Fiskars, Martha Stewart Crafts and more.